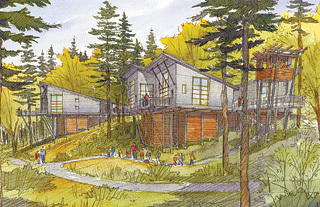 Construction has started on the $13 million Mercer Slough Environmental Education Center in Bellevue. The 12,000-square-foot center, located in a 320-acre wetland nature park, is a partnership between Pacific Science Center and Bellevue's Department of Parks and Community Services. It replaces a 2,100-square-foot complex on the site. The expansion has been on Bellevue's to-do list for the last 20 years, according to Apryl Brinkley, the site manager for Pacific Science Center. A $3.5 million grant from the federal Department of Housing and Urban Development helped with planning. The expanded center will be a cluster of low-impact buildings, including a multipurpose building, two classroom buildings, two wet labs, a visitors center and public restrooms. A lift system is being planned to make the upper buildings on the sloped site more accessible from the parking lot below. Plans for a tram were nixed after the cost was determined to be too high. The project, designed by Seattle's Jones & Jones Architects and Landscape Architects, is expected to become Bellevue's first LEED-certified project. The city will pursue a silver or gold rating. Most of the structures will be built on platforms supported by a unique pile-and-beam system designed to lessen the center's impact on the surrounding wetland. The elevated buildings will have adjacent boardwalks as high as 30 feet off the ground, bringing visitors closer to the tree canopy and offering panoramic views. Two buildings that won't be elevated will have green roofs. Other sustainable features will include recycled construction materials, including the pilings that support the buildings, and controlled runoff from the buildings. The center will experiment with different asphalts and construction materials to provide a laboratory for testing green-building systems. Drills used for the construction are also environmentally friendly, running on corn oil to eliminate the threat of toxic spills. When the center is complete in the fall of 2008 it will serve approximately 40,000 visitors annually for events and programing such as field trips, wetland field study programs and parties. The general contractor is Berschauer Phillips Construction Co.